Best Western Regency Inn est idéalement situé dans le centre de Marshalltown. Venez découvrir et profiter de notre hôtel à côté des principaux sites touristiques. Réservation au meilleur prix et offres exclusives toute l'année. Superbe situation… Superbe service… Superbe personnel… Superbes tarifs… le tout sous un seul toit ! Le personnel du Best Western Regency Inn vous invite à séjourner dans votre résidence secondaire. Notre hôtel jouit d'une situation pratique, offrant un accès aisé à l'autoroute. En outre, il dispose d'un excellent service clients et d'équipements de catégorie supérieure. Notre restaurant est l'un des meilleurs de la ville. Style américain décontracté, il sert un peu de tout : biftecks et côtelettes, pâtes, hamburgers, salades, sandwichs, diverses ailes de poulet, célèbre Peetza Pie et toute une variété de boissons fraîches ! !Nous sommes fiers d'être le plus grand centre de conférence de la région. Notre personnel compétent veillera à ce que votre conférence se déroule dans les meilleures conditions possibles. Nos salles de conférence conviennent aux réunions de toute taille. Nous serons ravis de répondre à vos besoins ! Passez un excellent séjour ! "Not informed/ overcharged/ Staff doesn't care." We apologize for your experience. We will use your review as a training tool for future guests. Thank you for your valuable feedback. 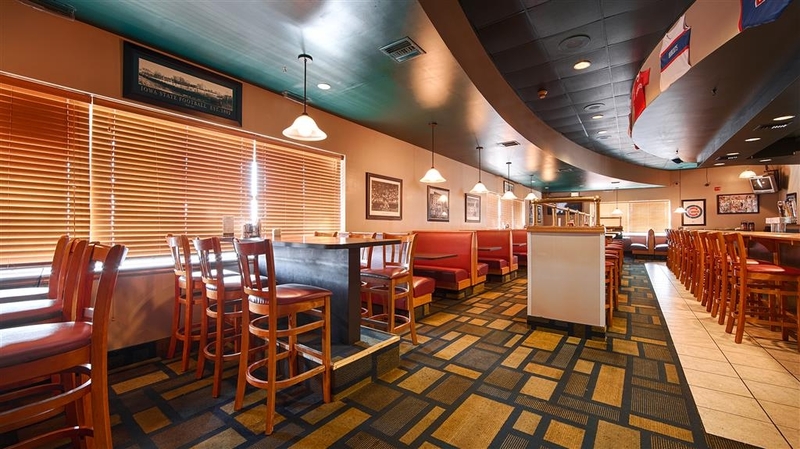 Well maintained and updated property with remodeling of attached restaurant. Comfortable room, clean environment. 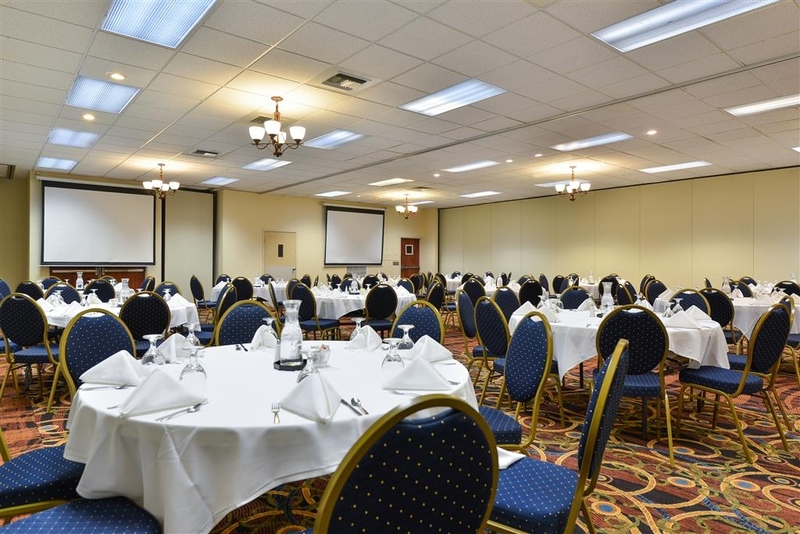 Including a large pool, workout space, many conference rooms, and a continental breakfast bar with a separate eat in area. The lobby is set up in a lovely arrangement with a coffee, tea, and water station, Large comfortable chairs, newspapers, and a fireplace. In rooms, plenty of linens and towels. New, fresh looks, right sized room for two, plus people. Fridge, freezer were helpful for us. Clean rooms. Pleasant staff. Nice breakfast options. Could not try the restaurant attached to the hotel as the kitchen was under renovation. Also stayed here in December 2018 - same great experience. Will stay here again. "Very bad info on website"
If you are thinking of staying at this hotel because they offer a restaurant.....don't. I chose this hotel because I was coming in the winter when it's very cold thinking I could eat my meals here. The restaurant is closed indefinitely. No mention of that on the website or when I called to make my reservation. They do not remove snow or ice from in front of any door when it would take little effort to do so. It's extremely dangerous. Staff is great but not letting guests know the restaurant is closed is misleading and false advertisement. Horrible experience. We sincerely apologize that our kitchen remodel is taking place during your stay. We hope you will consider staying with us again in the summer when our renovations are complete. Thank you for letting me know that our staff didn't let you know the restaurant was closed. I will use this as a training tool so our staff may better inform our guests. 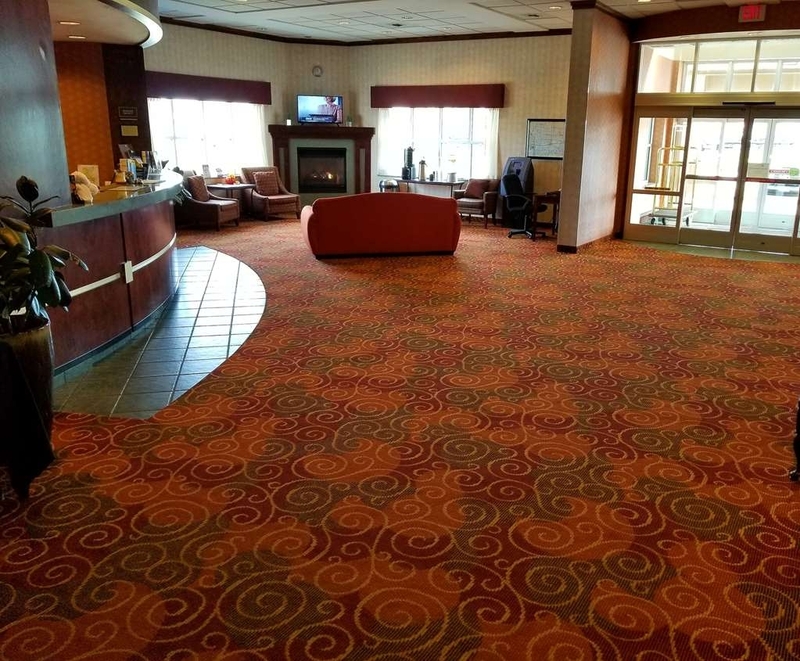 We stayed at the Best Western in Marshalltown New Year's Eve, December 31st 2018. I booked 2 rooms as there were 2 of us couples staying. We weren't there a lot as we went to Meskwaki for the evening, but the rooms were very nice. The staff especially on checkout and the ladies in the breakfast room were very nice and helpful. I stayed at the hotel during the Girls State Swim and Dive Meet. I felt right at home when I stayed here. The staff was friendly and the rooms were nice. 10/10 recommend if you are staying in Marshalltown! The staff was very helpful and accommodating. We had a large group and they were great at accommodating early check-in, late check-out, and they were able to find us a place to eat together as a full group. Very nice staff. Good breakfast variety included. Overall very clean and comfortable. Convenient location and parking pool and workout room.lam not happy that I have to use 200 characters to complete this review. Thank you for your kind review! 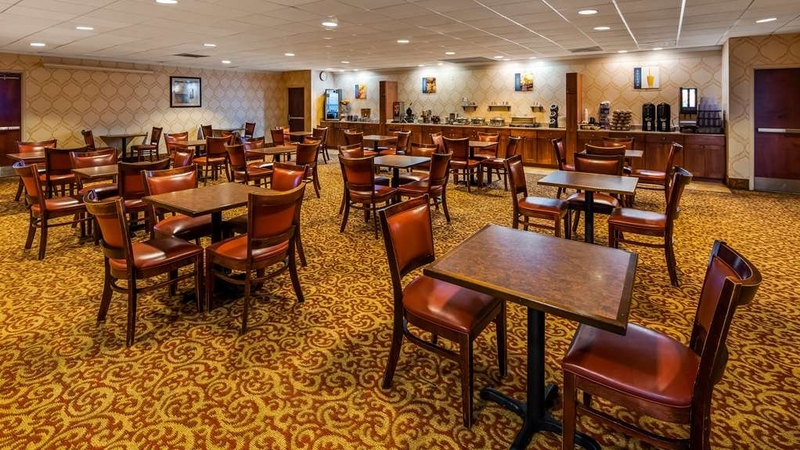 We look forward to your next stay with us at the Regency Inn! I apologize for your experience during your stay. I will use your review as a training tool to better our guests experience. "Below Best Western standards in my opinion"
"No bathroom and didn't care"
We stopped here on our final leg of a 4000 mile, 3 week motorcycle trip. Our room was dirty, carpet was stained, shower wouldn't drain and the toilet was plugged...great. Called the front desk and they sent two guys to fix it. Poured something down the shower drain so the room smelled like sewer and said he fixed the toilet. In the morning the shower did drain but the toilet was still plugged. I went to check out and told the lady at the front desk about the problems and about some guy banging on the door during the night and told her that this place was probably the worse place we'd stayed on our trip. Told her it would have been nice to have a working bathroom and all she said was... sorry. Not another word. So if you want a dirty room without a working bathroom, this is the place for you, otherwise I'd suggest you go elsewhere. I did not check in until after 5:30PM. When I first entered my room, I found the room to be a complete mess, the bed wasn't made, garbage in the garbage cans, pieces of something on the floor, and the bathroom had towels and washcloths thrown all over (the room was never cleaned is what I am guessing). I was then given another room after I complained (which the hotel service lady was not very empathetic to the situation as she kept rolling her eyes because she did not like what I had to say, but she did give me a $10 gift card to the restaurant attached to the hotel). The next room wasn't much better. There was garbage on the floor tucked under the bed skirt and it looked like someone shaved their dog on the floor between both the beds! It was disgusting. the restaurant was disgusting as well. The fries were cold and the waitress and cook did not listen to how I wanted my food prepared. They added onions to my husband's white hamburger (which I have never seen beef that color of white before). He is allergic to onions! I emailed the general manager Collin Northcutt at [email protected] and assistant manager Karla Durnil at [email protected], but I have not heard anything back. I even send them the pictures I took of the room. Worst experience I have ever had. I go to Marshallotown once a year and I usually stay at the Best Western. NEVER AGAIN!!! My advice, pay extra and go somewhere else! Thank you for your review. I have notified our housekeepers of the issues you encountered. We continue to train new housekeepers during staffing changes and this will be used as a training tool. 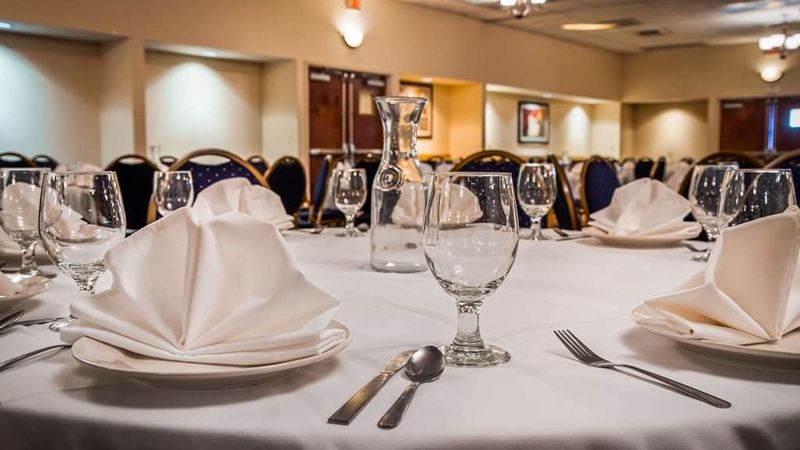 We hope to exceed your expectations the next time you visit Marshalltown. Very nice hotel. Breakfast was good and served by the nicest lady you would ever meet. Staff was pleasant and helpful. Would definitely stay here again. No hot tub or sauna, but there is an indoor pool. Thank you for your review! 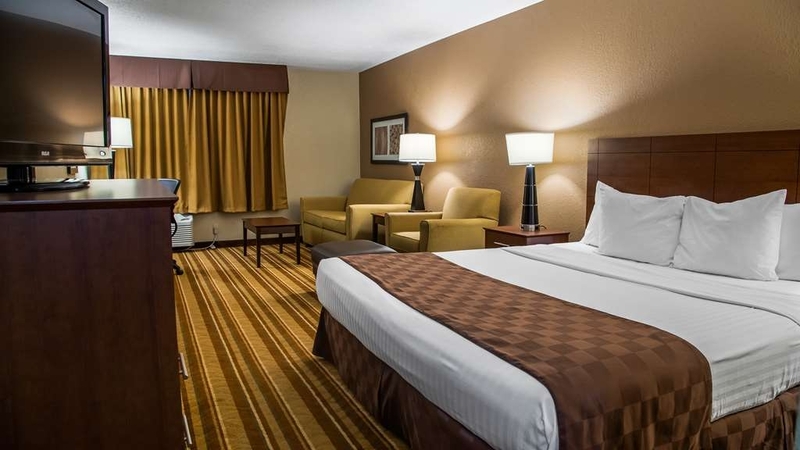 We look forward to your next visit to Marshalltown! The hotel was very friendly and helpful. It was nice that there is a restaurant on site. The food was priced very reasonable and good. The outside grounds could use some cleaning up. 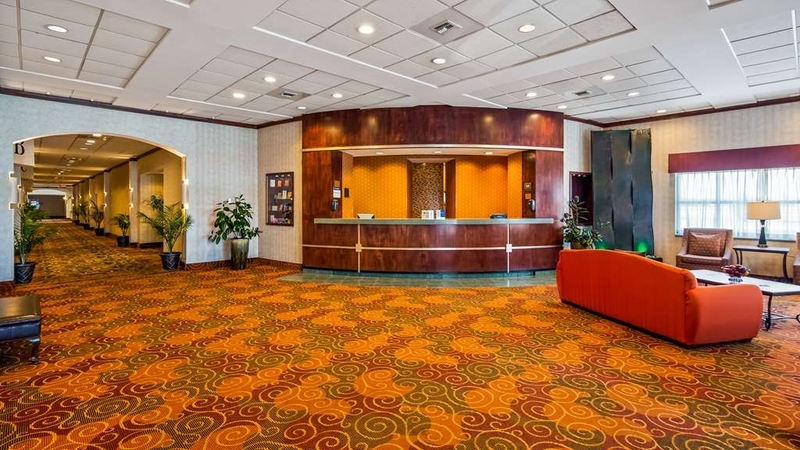 The price was very competitive to the other hotels in the area, Hampton, Quality Inn, and a few more. We had a very nice room with a refrigerator and microwave. When we checked in after 4 PM we went down to our room and it hasn't been cleaned yet. We found a maid and she said she would clean it right away. We went down to bar and had a couple drinks and when we got back the room was finished. The bed was okay to sleep in but it was to soft and a little lumpy. Breakfast was ok nothing to brag about, but you could fill yourself up. I have stayed on this property twelve times over the years, on business, including the one I am addressing in this review, which was for pleasure. This hotel is a nice, clean and comfortable place to stay, but the night of 26/May/2018 has completely blown my opinions of this place. This was our second night, and the place was full of families with all ages of kids, so I wasn't too surprised to have the knock on the door a few times with some kid saying "House Keeping". No big deal! At 10:00 pm, the room telephone rang once waking my wife and I, and upon answering there was nothing but a dial tone. At 10:05 pm, There was a knock at the door, and I went to the door to see what was going on. As I was approaching the door, the door opened, but was caught by the safety latch. I jerked the door open, only to hear someone running down an adjacent stairwell. I called the front desk, and after 15 to 20 rings, it was answered. I explained that someone had attempted to enter our room, and I was told by the young lady at the desk that it was she, that had tried to get into our room..... Really!?! She said that she was checking to see if anyone was in the room. This whole thing sounded just a bit suspect. I would be interested to really know what goes on in this hotel after normal business hours!.... Or maybe not! Needless to say, I will never stay here again. Just another reason that I don't travel unarmed anymore. "Cat piss and stone hard beds." Upon arrival, all was well, Sabra at front desk was a sweetie. Got assigned a room. No outside doors were locked, hallways stunk of cat urine, rooms were about 90 degrees. Appearance and decor of rooms I would consider IKEA quality. Fake woods, cracking plaster, peeling caulking. Went to O'Hungrys Bar/Grill for supper. Sat at bar and ignored for some time before drink order was taken, approx 25 minutes before drink showed up. Had to choke down drink because of poor quality. Completely ignored, had to beg to have check brought to us. Walked a block to Applebee's for a grand experience! Couldn't sleep more than 1 hour at a time, beds were extremely hard. After work the following day, checked out and continued my 2 week stay the the neighboring Hampton. "Great value in this town"
This is an older Best Western that has received some updates. The rooms are average with some older furniture, etc. but the room heater worked (though a little loud), the shower was decent and what I needed was there. The staff are friendly and helpful. The included breakfast is standard eggs, bacon, cereal, oatmeal, toast, etc. The coffee was decent and, again, they had what I needed. The lady who works the breakfast space was awesome and her pride in her work is evident. I had a couple of minor issues in the room and they were addressed immediately. The room price was great with an included breakfast, access to the highway, a restaurant if you need it and friendly staff. "Awesome Hotel to be able to RELAX under one roof"
I have never been to a hotel that has all the ammenties under one roof... Hotel, restaurant, bar, conference room, pool and fitness center. Along with a outstanding staff from front desk to housekeeping and everything inbetween. I would recommend, if you would like to have fun stay at a place with all the ammenties and be able to enjoy your day/evening with no need to go anywhere else. Oh yes, the amaxing lighted waterfall in the lobby! Stayed here for our 50th class reunion and had a wonderful time. The hotel made us fee right at home and all the staff we encountered were very friendly and helpful. They have an excellent pool for swimming and lounging around, and a decent fitness center. The complimentary breakfast was good with a decent variety of foods, including scrambled eggs, potatoes, sausage, waffles, cereal, breads, etc. 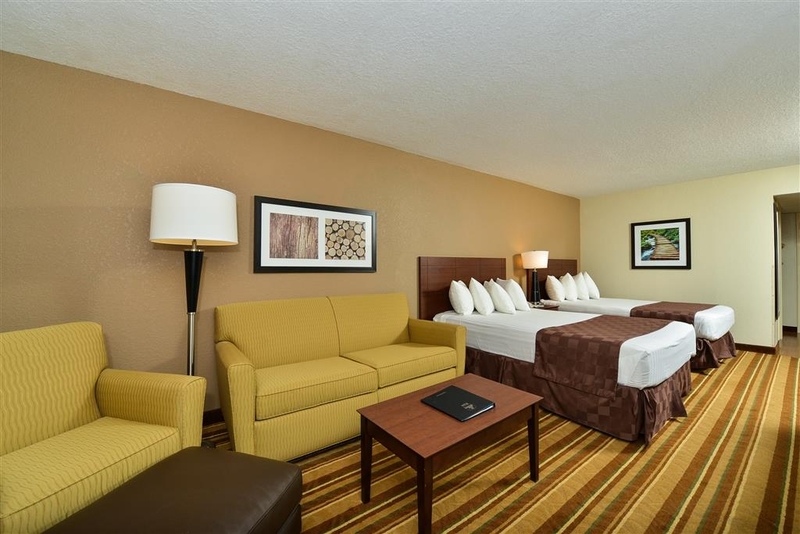 The room was spacious and clean with a king-size bed, easy chair and good work space. One of the important things is there were plenty of power outlets. Room also had a fridge and microwave and good sized TV. 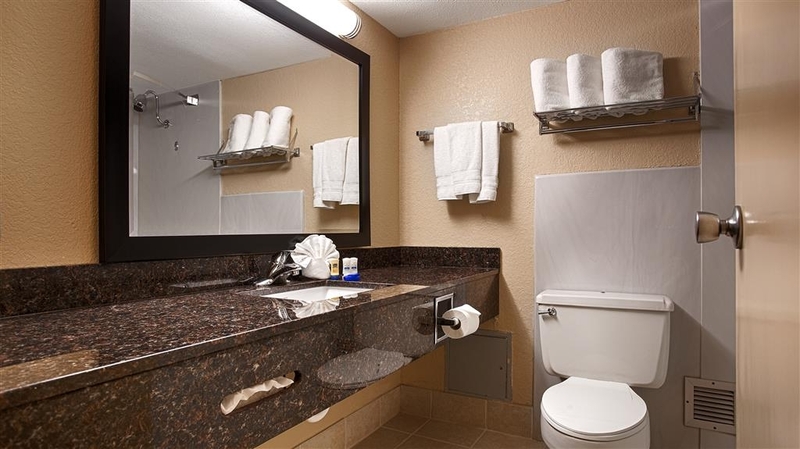 Bathroom was clean and neat with plenty of towels, etc. Definitely a place I would consider staying in again. ""The Sun Will Come Out, tomorrow""
Last year I stayed at a BW Best Western Hotel and Resorts Facility. I could see changes were being made, but they were not quite up to par. I said, "perhaps tomorrow." And indeed, their "tomorrow" is here. My stay was wonderful this year. 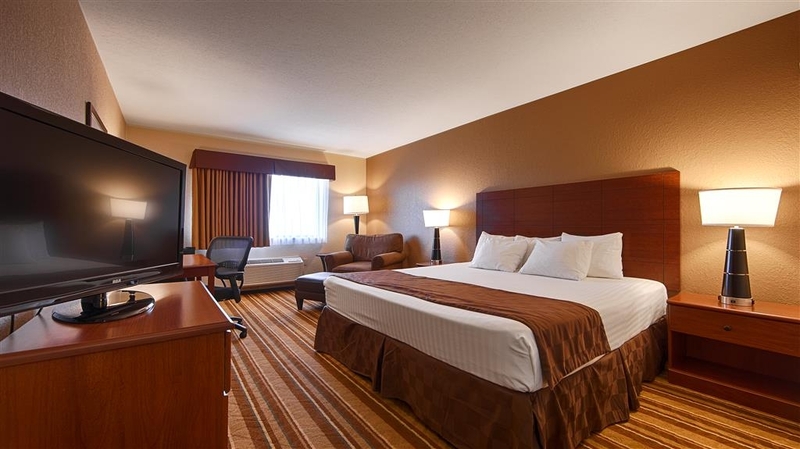 Great value for the money and worth exploring on your next business trip or vacation. 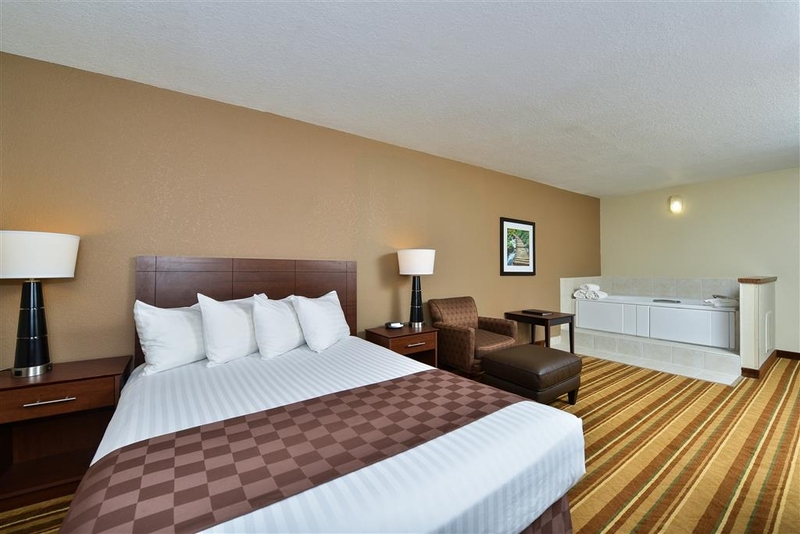 Beds comfortable and amenities including pool, exercise facility, meeting rooms, and clean, comfortable bedrooms. All I can say is, "Bet your bottom dollar!" Staff was very friendly and helpful. Complimentary breakfast was fantastic. Pool was large enough to accommodate many people. Convenient having the lounge and restaurant on site. Ample parking space. Clean room. "Nice amenities and great customer service"
The lady at the check in was very nice, gave us a pamphlet about different places to eat and things to do in Marshalltown. Also gave me a complimentary drink ticket for the restaurant that was attached to the hotel which I have never stayed somewhere were they did that, it was very nice. The pool is 8ft deep which is very unusual most of them only go 5 ft. so my kids loved that. The breakfast was wonderful - biscuits and gravy, eggs, bacon, waffles (strawberries & chocolate chips to go over waffles), yogurt, bread, etc. "this was our first and last time for our family stay"
The staff was friendly but we was not happy with the pool restroom and no clean towel at the poor area. Also, the internet was very poor. This was our first time stay at this hotel also our last. We end up use our phone data if we use the internet. I'm sorry to hear of your experience. We will improve. I hope you will try us again in the future! "Time to make some improvements! !" We stayed here while visiting family in the area. Our stay was for 5 dsys. Honestly, we should have checked out before that, but moving 2 teens and all of their belongings seemed too big of a challenge. I could go into details, but this review would be too long and frankly, I don't want to spend anyour more time than necessary on this worthless place. My major issues were Wifi bandwidth (we were told that the hotel was at full capacity with detasslers staying there and they were using all the bandwidth. But we couldn't get it to work even in the middle of the night ). With my cell phone not working, I reverted to the old fashioned way of communication, the desk telephone. Guess what? It didn't work. After contacting the front desk several times, they ended up dialing the number for me and then call ed me back when they were able to patch the call through to me. Reminiscent of my childhood, watching "Green Acres". The bathroom had no exhaust fan, so the steam from the shower came back into the room and the humidity level was crazy, even with the A/C working on High. The unit was clearly not performing up to psr...and it drained right back into the room, causing the carpet to be soaked where it drained in front of the window. The overall condition of the grounds, with cigarette butts and full garbage cans by every exit was shoddy. I even poured my bottle of water onto a smoldering ash tray fire by our exit door one day. Same door the employees go out of to take their smoke breaks. You would think they would notice all the refuse there, but in the 5 days I was there, that wasn't the case. On a positive note, the attached restaurant had very good pork tenderloin sandwiches for a reasonable price. Yikes! I understand your frustration. We will work to make sure we fix the issues. I hope you will try us again! I promise you a better stay! "no WiFi access the evening we arrived"
It's a pretty good hotel. Staff are helpful and friendly. When we arrived at about 9:30 p.m. we were given coupons for a free drink in attached O'Hungry's. That was a definite plus. The room was comfortable...mattress a bit creaky. It's almost unforgiveable that the WiFi wasn't working the evening we arrived. However, it was working in the morning...so I'm not so disappointed. Thank you for your kind words. I apologize for the inconvenience with the wifi. We will definitely look into fixing the issue. Nothing special to report. Sink drain was slow. The hallways were like a sauna. Many guests were loud into the night in the hallways. Restaurant was cheap (very average food and service). Since there are no better options in Marshalltown, I would stay there again if I needed to be in the area. I'm sorry we didn't meet your expectations. I hope you try us again. I know you will like it better! Didn't clean room or replace towels each day. Had to go to the front desk. Very loud in the evening and not controlled by the staff. Breakfast very low quality. Not stocked well and long line for the one waffle iron. Yikes! Definitely not our norm! We will make sure we bring this up to our staff and correct your issues. Please try us again. I promise we will be better! Stayed here for a week getting ready for our daughter's wedding in Marshalltown. Had a room on the first floor which worked out perfectly as we had a lot of things to carry in and out, and there is no elevator to the second floor. The room was clean, a good size, and quiet. The front desk staff was very accommodating and made sure we had tickets each day for the free breakfast in their breakfast room and also a drink at their O'Hungry's Restaurant on site. There was, also, coffee and a water dispenser with fresh fruit in it in the lobby. The breakfast was very good with two types of scrambled eggs, a meat (either sausage patties or links, bacon, or ham), potatoes, oatmeal, make your own waffles, cold cereals, yogurt, toast, and juices. The breakfast staff was friendly and kept everything filled and clean. The pool was a good size, very clean, and also a quiet retreat while we were there. 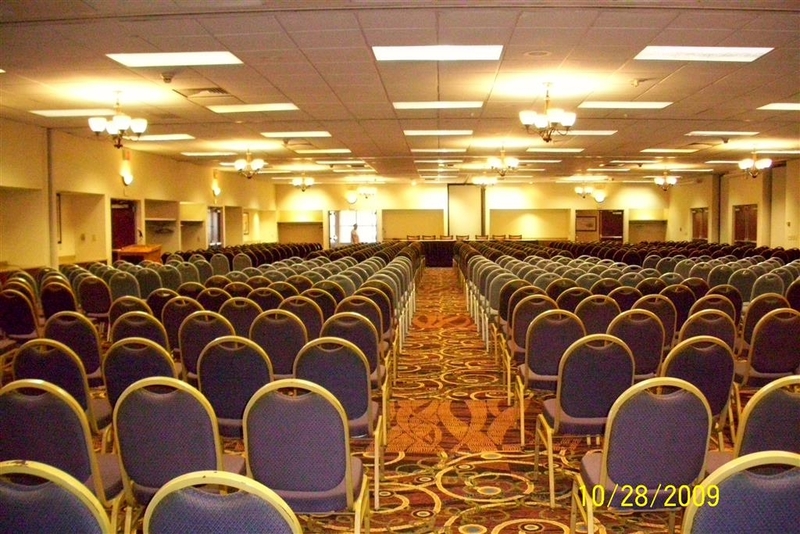 Lots of conference rooms available for special events. We enjoyed walking across the parking lot and getting ice cream at Culver's each evening. 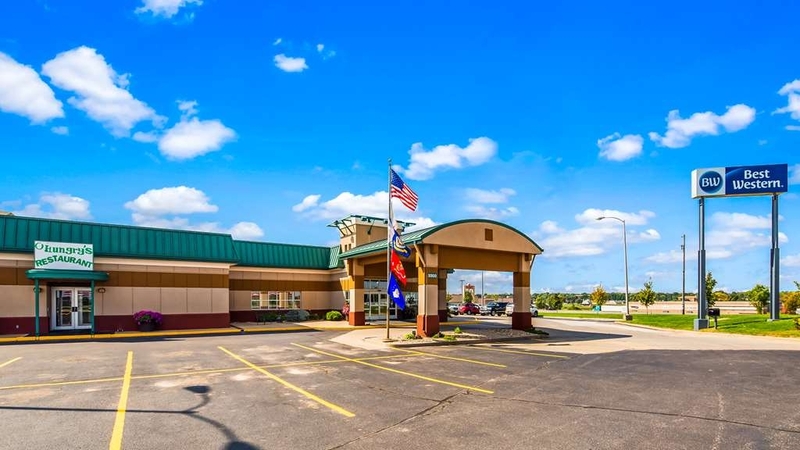 This hotel has very easy access off the highway, and we would definitely stay here again. Thank you so much for taking the time to review us and for the kind words! Please see us again and try out tenderloins in the restaurant. Check in was nice and easy with very helpful staff. They know how to treat there guests. First time I have visited and would return if in the area again. The king size bed was a little hard for me but then nothing is like home. The staff is very friendly, the rooms are reasonably priced, the pool is neat- 3'-8' deep. Had fun at the lounge and the breakfast was very good. Even served on real plates and dinnerware. Good place to have conferences-lots of meeting rooms. Nice place to just get away. Thank you for helping us tell others by posting on TripAdvisor. We enjoyed having you stay with us! Please come again and try our award winning tenderloins at O'Hungry's Restaurant! My husband and I attended our niece's wedding and stayed here 4 nights. The staff were very understanding and allowed us to check in early after an 1100 mile car ride to get there. The room was clean and sufficient. We were in and out and needed our room not to be disturbed. The cleaning crew gave us that option and I had to go to the front desk to get linens--which was a little upsetting but ok. The breakfast was delicious and hot. An attendant was alert to our needs and immediately went to get what we wanted. There were 4 rooms reserved for our family and not a complaint. One problem--one of our nieces had her car broken into after accidently leaving her purse on the front seat. The police were on the scene asap but didn't catch the thieves--so beware there maybe someone waiting to catch your mistake. Thank you for your kind words and your honesty about your experience. We hope you will stay with us again! "Amazing, amazing staff. great bar." I stayed at this hotel for a family reunion. The rooms were big, $2.00 all day draft beers (good beers) at the bar. This is the best staff I've seen in years-a shout out to Molly at the front desk, Veronica in housekeeping and Francisca who manages the dining room. Friendly, eager to help despite a full hotel. They managed a full hotel with grace and style. Thank you for taking the time to review our hotel. We loved having your group with us! I will gladly pass along your kind words to our staff! Please come and see us again! 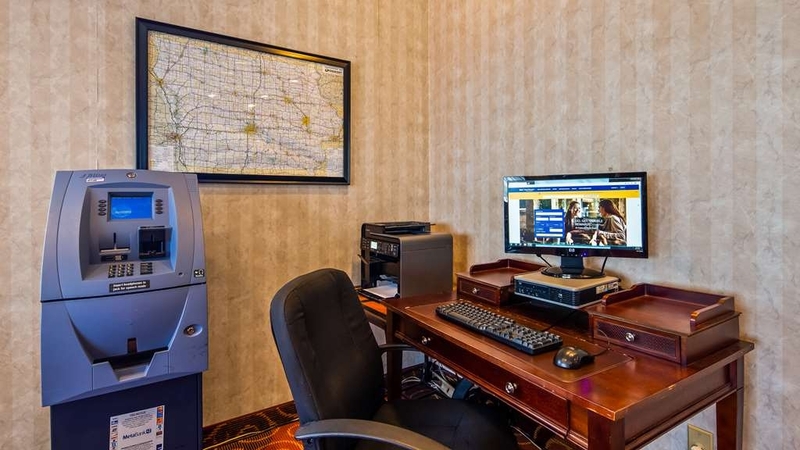 I needed to be in Marshalltown for only one night's stay, and this Best Western is top-notch in every way! I did use the pool, and it was super! the breakfast given complimentary was also very, very good! Building and grounds well-maintained! My room and bed were also super! THANK YOU so much for the kind words about our hotel! Please visit us again! We would love to have you try our amazing Tenderloins in the restaurant! "Visiting Marshalltown for Iowa Girls State Golf Meet"
This was a busy place as many golf teams stayed at this location. This is a older building. Liked that it offered several eating places nearby. We ate at the restaurant connected to this motel which was convenient. Offered a large swimming pool but no hot tub. Also had work out room. And the breakfast offered was ok, just a lot people needing to eat at the same time and couldn't keep dishes refilled fast enough. It would have been nice to have TV guide in our room to find local stations and sports channels. Thank you for taking the time to fill our a review on us! We enjoyed having you stay with us! Yes, i was definitely a busy weekend. I am sorry we did not keep up with the plates. I know how frustrating that can be. Please try us again soon! I know we will do better! "Quality hotel with great value." 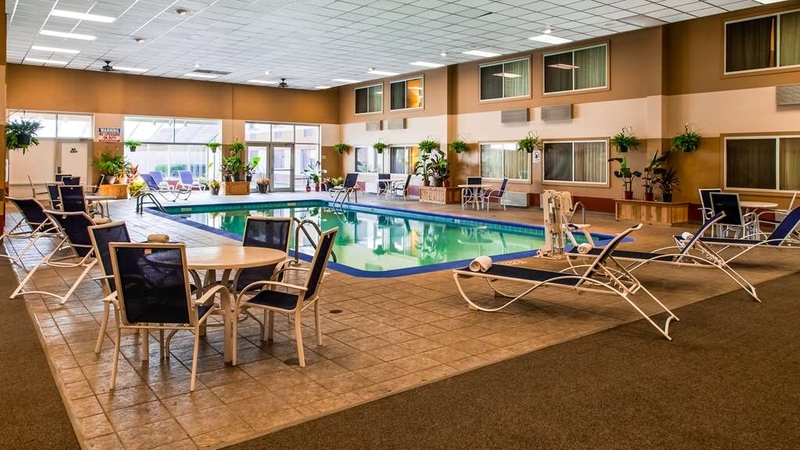 This is our second time staying at this hotel for an annual event, we like the large pool - location- breakfast- on site restaurant-and the Best Western reputation. It doesn't disappoint! The staff is extremely accommodating. If we get back to the event we'll definitely stay here! "High price for lower class hotel." Pricing of a Hampton for a Baymont. Average hotel, no elevator. On premise restaurant and bar was sub par. A little out of date. Clean and service was good. Breakfast was average hotel food, eggs, potatoes, sausages, waffles. Etc. Thank you for taking the time to fill out a survey on your stay! Your comments are appreciated. We want to exceed you expectations and will work to do that. I hope you will visit us again! Yikes! Due to safety issues we try to limit people using our pool to only our guests and keep food and drink out of that area. We also try to give a 5-10 minute courtesy notice about closing the pool. I am sorry if you feel we handled it incorrectly. had ants in room, found 2 of them in our bed as we were sleeping. needless to say we did not get a good nights sleep. as we were checking out informed front desk and told her she could come down and see them, she did not take this opportunity and said she would have Maintenance look into it . we were not offered any type of discount. 2nd room the front desk called around midnight and asked if we could keep the noise down. she was told that she must have the wrong room and she then stated she was going to walk down and find out and the call was ended. instead of asking us if we were the ones making the noise we felt like we were being accused of something we simply did not do as I have stayed at this same Hotel a couple of times before with no problems. Other wise the over all experience was great. nice Hotel, good breakfast and breakfast staff. staff at check-in was good. Thank you for letting us know where we can improve. We have contacted the exterminator to take care of the issue. We promise to do a better job with you next time! Very nice hotel - superlative staff and a breakfast spread beyond belief - so many options it's hard not to pig out! The rooms are very nice and most comfortable bed and bedding I have encountered in a long time. Thank you! I will pass along your words to the staff. Please stay with us again when you are in the area! Thank you so much for your kind comments! We enjoyed having you stay with us! Hope to see you again soon! Dear Karenm014, Thank you for taking the time to write this review and share your experience. I am terribly sorry to hear of your disappointment with our hotel. On behalf of our entire team, I would like to apologize for failing to exceed your expectations. Know that your voice is important to us and that we are working hard to address these issues and improve upon the guest experience. I hope that you will consider staying with us again so that we can have another chance to provide you with a superior experience. With the bedbug infestation and the problem of not able to see the bottom of the pool (grate). I was obligated to not stay at this hotel and had to change hotels. Manger did assist us in moving hotels. Ms Conley: We apologize for your experience at our hotel. We have taken the steps needed to remedy the situation. We enjoyed hosting the health group you are with we are happy to report no other complaints on both issues you had brought up. One of the best free breakfast buffets that I have had in quite some time, and, the room was very nice. Also, the staff is very nice, and, very willing to make sure that you are satisfied with your stay. I will definetly stay here again! My son and I had a Great stay at this Hotel. was there for the Verb Classic MX race. Room was very nice, food at the Restaurant was good and the Service at hotel and restaurant were good no complaints. The rooms are comfortable and clean. Nothing fancy, but very adequate. A large hotel with conference center. Gas & Fast food is close if you need a fill up or quick snack. This hotel was able to accommodate our group of 50 students traveling Iowa, while at the same time having a wedding party and a conference. So we get into our room which was two queen beds, my 18 month son starts playing on the bed we weren't going to sleep, then my wife sat on the edge of it and the whole bed flipped up. I looked under to find out one part of the bed was being held by a cinder block. That's right a cinder block. On top of that there was candy in the corner and the place was filthy and in bad repair. I complained to the front desk but they wouldn't switch me rooms, not that I think that would have helped. Yuck yuck yuck, don't go to this hotel. I've always been loyal to Best Western, not anymore. Great hotel with many amenities. Pool was large enough for a number of people. Lounge and restaurant was a convenient feature. Hotel staff was friendly and helpful upon check in. Free buffet style breakfast was offered. An older style hotel whose clients seemed to be mainly workers in pick-up trucks. But it was fine for me for a one night stopover. My room was comfortable and clean. Although served in a no-frills room the breakfast buffet was excellent with a range of hot items. The biggest disappointment was the hotel restaurant where service was so rude and slow that I walked out before sampling the food. "Amazing Staff; Facilities need some work"
WIFI needs work (intermittent and slow when working) as do some of the facilities (soap dish in tub hanging by caulk alone in room 105) Nonetheless, this older hotel is fairly well kept and the staff is amazing. Not sure I have been interacted by so many hotel staff in a long time. They love their facility; and I was thanked more than once for coming and they went above and beyond at every turn. This hotel is very clean and the staff is friendly, we were there for only one night for a funeral. Did not have the opportunity to check out the other features of this facility as we checked in late in the evening and out early the next morning. "Don't miss out on great hotel"
Best shower head ever! 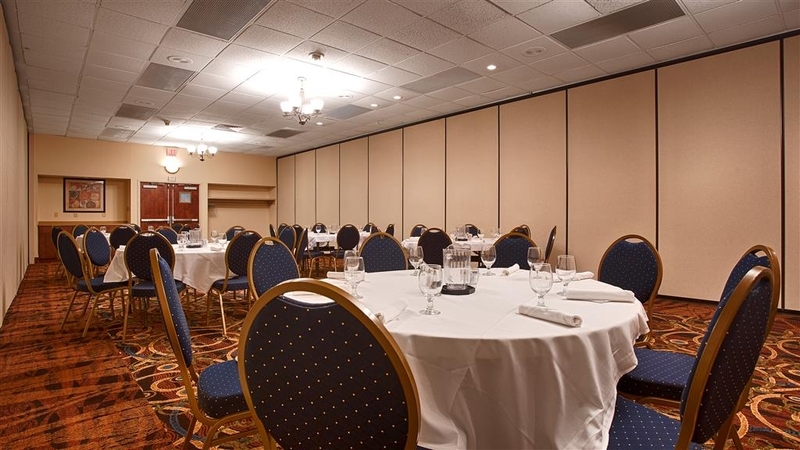 Very clean, conference center hotel with excellent rooms, pool and amenities. Staff were very helpful and courteous. Good internet connection, comfortable beds with microwave and refrigerator in room. "Nice place to stay with new decor"
We were in town for a reunion for a two night stay. The staff was very accommodating in letting us check in early. The lounge staff was very friendly. 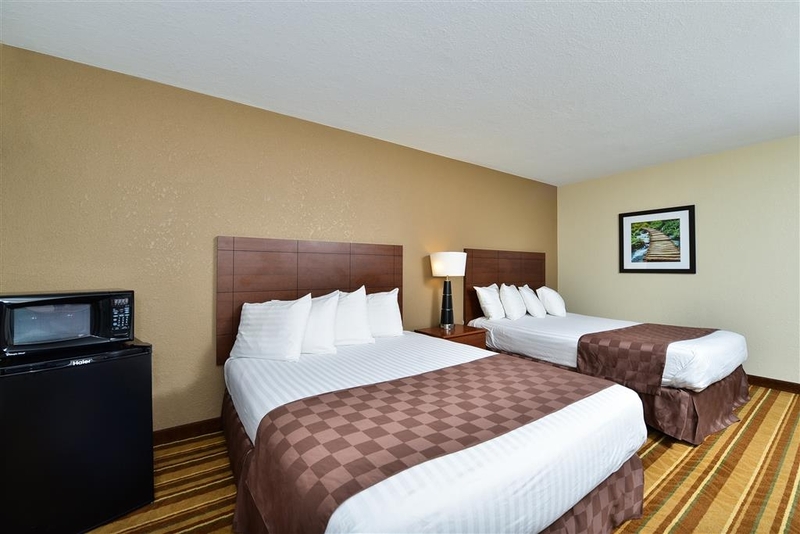 They have completed a lot of the room upgrades so the decor, beds and amenities are much better than in the past. From the original scheduling of our stay until departure, logistically the staff did an amazing job. Our rooms were clean and convenient to the outside door (which was extremely important form my brother-in-law who is disabled). No complaints. We did not use the pool, although the area did look spacious and clean. "Tired of being lied to"
We called the hotel a couple of days in advance since we had heard rumors that the pool was closed. We were assured that it was open and everything was fine. On the night of our check-in, the pool was closed. The check in process took forever and it took about 15 minutes for somebody to show up. After getting to our room on the second floor without an elevator, our keys did not work. After the long hike back to the reception area, we were told that they cards should work now. No apology or anything. Guess what? The keys still didn't work. With negative attitude, we were escorted by a janitor to the room to show us how to use the card the right way. But guess what? The janitor couldn't get it to work either. In the end, only one of 3 cards worked, but we were treated like it was our own fault. The receptionist also re-assured us that the pool was going to be fixed first thing in the morning. We did some running around that day and by late evening it was still not fixed. We inquired about a partial refund since the main reason for staying at this hotel with kids was the pool. If we would have known that we could have stayed at the hotel across the road. The AC was a window unit and was very loud all night long. Unfortunately, there were some bad storms going through the second night and they lost power. It got hot very fast in our room. The breakfast was plentiful, but very bland and no fruits or other healthy options were available. Housekeeping was very friendly, prompt and courteous though, but that was unfortunately the best part about this hotel. We travel on our motorcycles. When we stay in a hotel/motel we like to have a restaurant within walking distance. We also like to be close to our highway of travel. I like to have an exercise room in which I can get up early and take a long (4 mile) walk in the early morning and avoid a road with a lot of traffic. This hotel fit the bill. It helped that I am a member of Best Travel Rewards, on the bill. we liked it so much that we stayed coming and going from our trip. The staff was friendly and helpful, the rooms were clean and we were pleased with everything. Thank you. Steve. The Manager and Staff in the Breakfast Buffet were outstanding along with the quality and selection of the food. This was nothing close to your typical Continental Breakfast we normally see at a hotel. Fresh Food and Real Food is a treat!!! The staff in the breakfast buffet where very nice and helpful. However the hotel needs some desperate TLC. Very outdated and had a bit of a musty smell. I was also disappointed that the pool didn't open until 9am in the morning. Room was very clean. Bathroom was very clean. Fantastic breakfast. Good value for the price. I will plan on staying there again next time I am in Marshalltown. Bed was firm. Rooms were quiet even with three State HS golf teams staying in the hotel. Dining room was spacious. Let me see, bar fight, no elevators, and front desk far from the locations of the rooms so when both room keys won't open your door it's a good hike back to have them reprogrammed. Would definitely not recommend staying there. Who gets so drunk that fight ensues at a hotel bar?? For the price you can't beat this hotel. 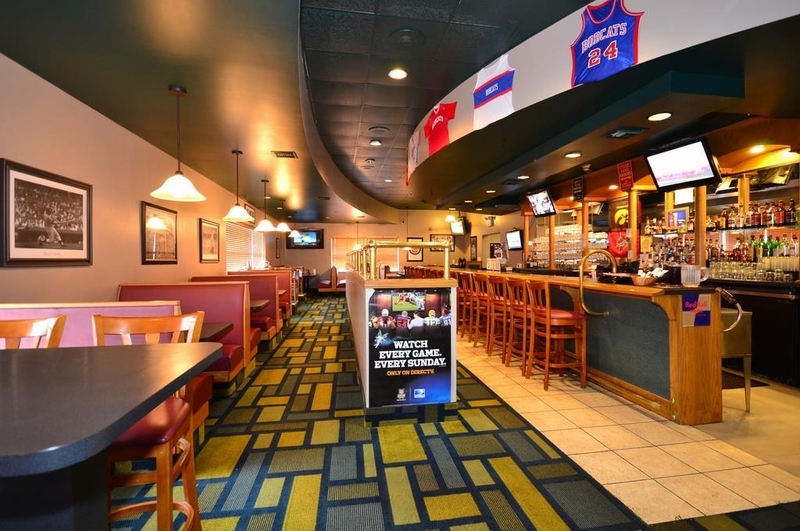 Onsite bar and restaurant provides good quality food and beverages at a very reasonable price. 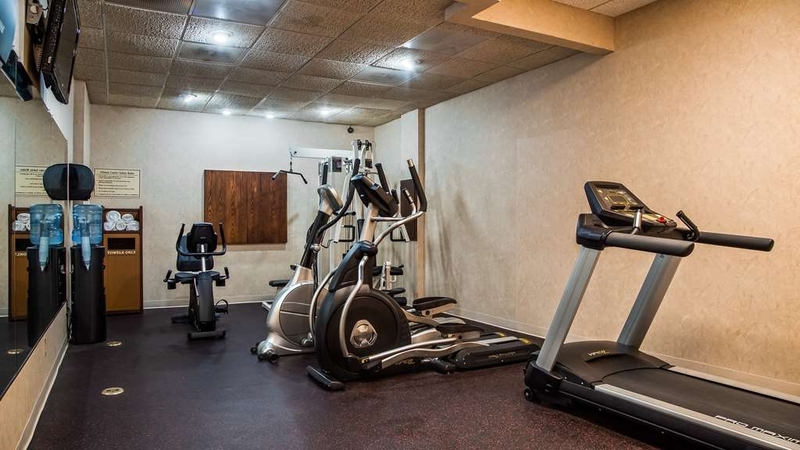 The fitness center is small but provides enough equipment to meet the needs of those just looking for a light workout. The staff is friendly and accommodating. Thank you for your recent visit! Thank you also for your kind words about our property...I will pass them along to the staff. Please stay with us again next time you are in Marshalltown! I let other reviewers be my guide and trusted hotel would be a good fit for my family's overnight stay in Marshalltown. Arriving to discover the pool would be closed for repairs for a couple hours longer and the room we were assigned was down a hall that smelled like fish, made me rethink trusting such positive accounts. However, the free breakfast was wonderful and the two women staffing it were very nice and organized! Thank you for taking the time to write a review of our property. I am sorry we did not meet your expectations. We have corrected all of the issues. I hope you will try us again..I can assure you your stay will be better. 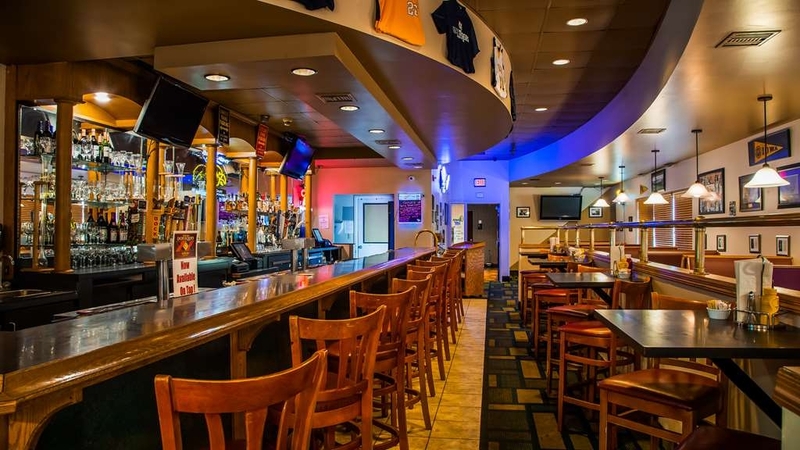 This older hotel is close to freeway and has a sports bar attached which was very convenient for happy hour and quick bite to eat. It has a large footprint which meant more steps for the older member of our party. Staff very friendly and helpful. Clean and comfortable. Not good location if you want to go for walk. Thank you for staying with us! We are glad you liked O'Hungry's Restaurant! If you are ever in the area again...please stay with us! excellent and the hotel is a value and worth while, great breakfast the staff was very friendly. some of the facilities are dated based on the location, but there are other attractions that make up for the age of the motel. Thank you for taking the time to fill out a survey! We appreciate your comments. We will be updating items in the hotel all summer long so come see us again! 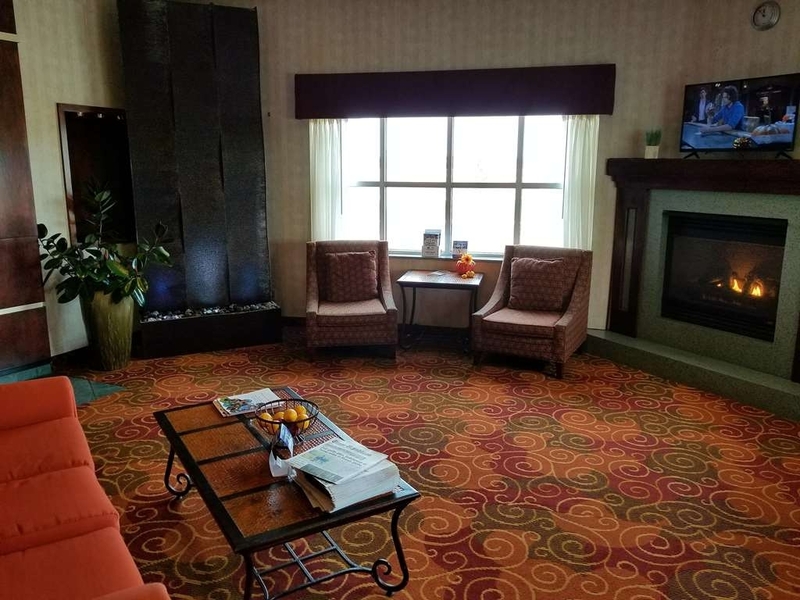 I was pleasantly surprised to realize how genuinely accommodating and sincere the staff appreciation of the medical nature of my stay in Marshalltown was and how they went above and beyond to assist me and I will share my experience with others. It was wonderful to have you stay with us! Thank you as well for taking the time to fill out a survey! Come see us again! Thank you for the review! You made our day! Please stay with us again in the future! "Nice Decor, a little to be desired"
The room looked nice. There was a concern with the hot tub leaking but it didn't cause much of a problem. The breakfast staff are very accommodating. The lobby has a nice décor. There was a convention in the hotel and they had a set up in the pool area and our room was next to it. The people were up a little late for us as we had an early appointment. Thank you for staying with us! We are sorry we did not meet your expectations with the noise. Please stay with us again! I assure you won't have a problem again! we were here for State AAU volleyball and it was a wonderful place. 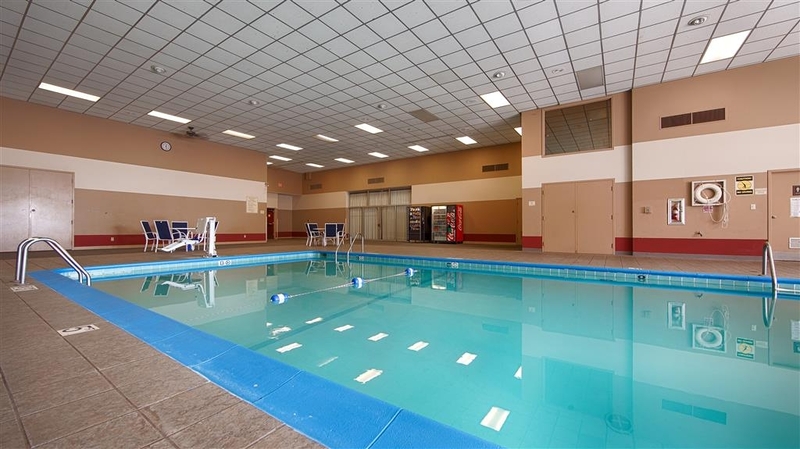 Pool area was clean, clean room, good food for great prices and great staff. We would for sure use this again as it was closed to both places we played and was easy to find. We were very pleased with this hotel. It surpassed our expectations. The only down fall is there was no elevator and we were on the 2nd floor. With a bunch of kids, we had a ton of luggage, so that was rather inconvenient. If it had just been myself and my husband, it would not have been a problem. they made me feel like I was at home, The staff was outstanding no matter what there job was,I will stay there when ever I need to stay in marshalltown,ia. told all the people I work with . and friends and family too. Comfortable bed made for a great nights sleep. Great pool, restaurant and lounge on premises. Nice complementary breakfast and friendly staff. 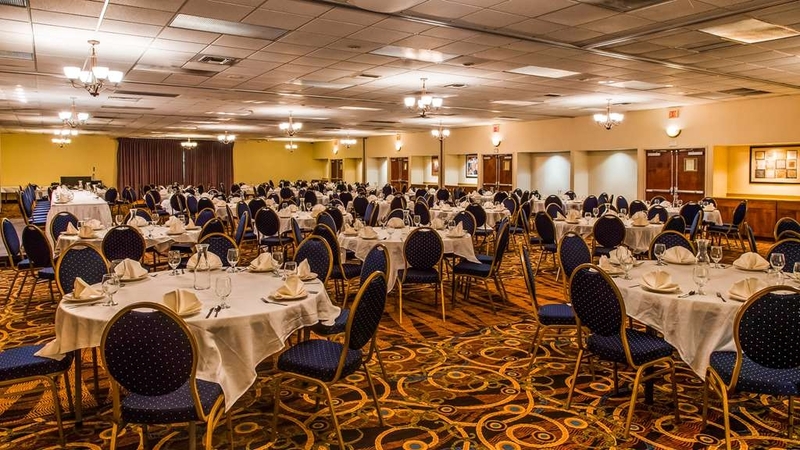 Large banquet rooms for anybody in need of a party or meeting room. It seems like there were some upgrades in the room and hotel, but still some very worn and unfinished looks in the room and bathroom. Tile cracked and did not match up with the carpet. Walls a VERY thin, we could hear everything in the room next to ours, kept us up until the wee hours of the morning. The heating unit stopped working in the night. On the positive side, they offered 1 free cocktail/beer/wine and a nice breakfast that was fully stocked, although it was very busy. I used the workout area, equipment was good, although the room was a bit dirty. Overall, I don't know if I would stay here again. 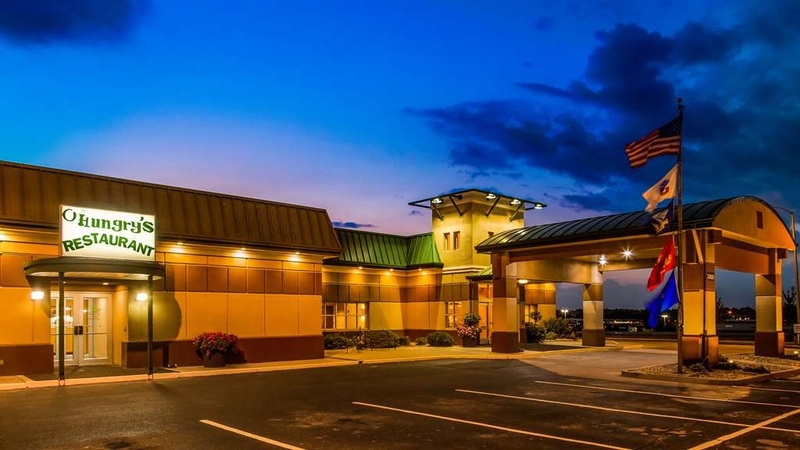 "Excellent Stay at BEst Western in Marshalltown, IA"
Fabulous stay at Best Western in Marshaltown, IA. Wish we could have stayed longer. 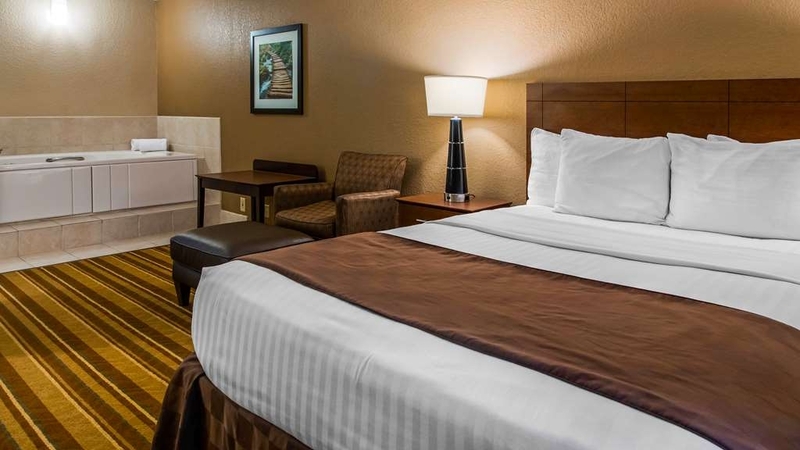 Excellent rates with perks, excellent staff, and amenities! 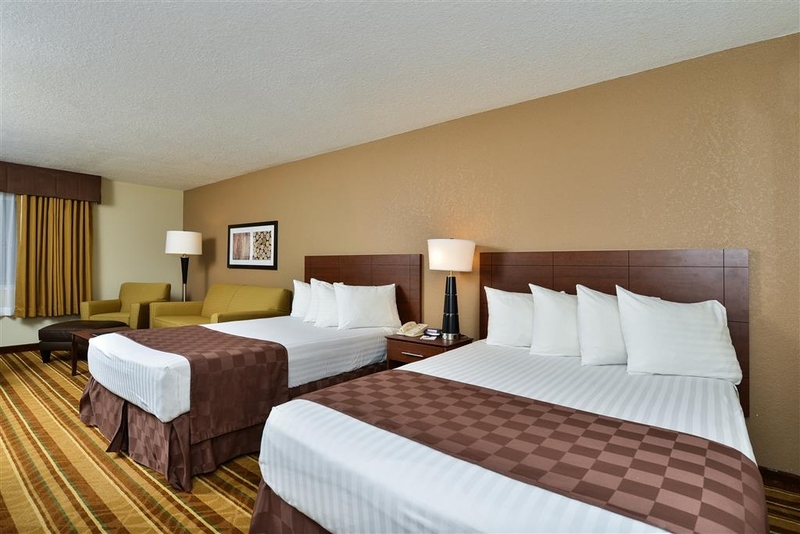 Very clean rooms and comfortable beds! 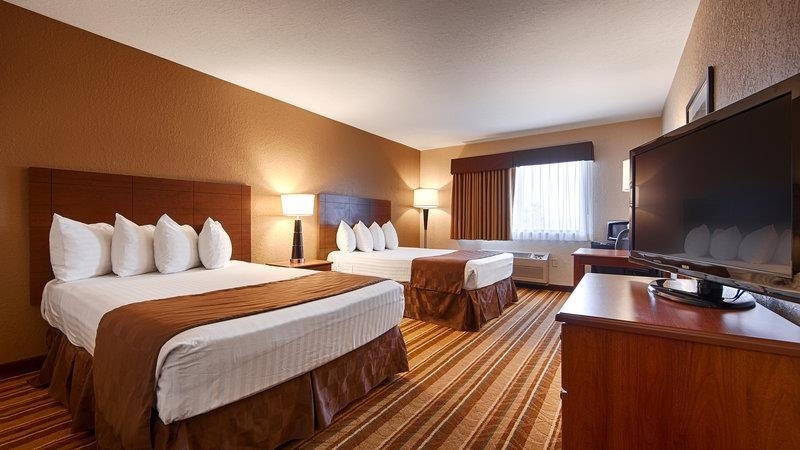 Best Western will be our first choice for accommodations when traveling in the future! Nice clean place good service the rooms were clean the breakfast was good. Good location lots of nearby restaurants I would stay here again when traveling through because of the location. so thanks to the staff for a great stay. Thank you for taking the time to respond with a review! Your comments are much appreciated. 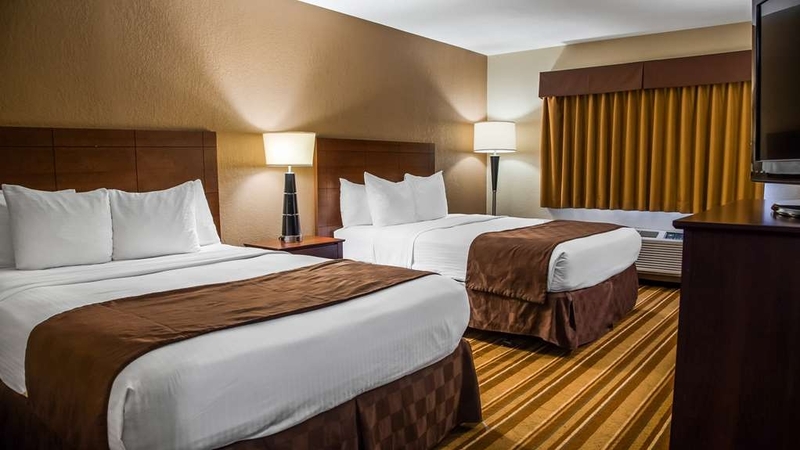 If you are in the area , we would love to have you stay with us again! My wife and I went to a family reunion over the Labor Day weekend and stayed here 2 nights, Saturday and Sunday. The room we had was on the second floor; the last one overlooking the swimming pool. My only complaint about the entire stay was that the room air conditioner is drawing air from the pool area. I smelled chlorine more than once. And I can't see how drawing this moisture laden air is healthy to be bringing into a hotel room. My advice, if it is a time of the year that air conditioning is necessary, stay in a different room than one drawing air from the pool area. The first night, I suspect there were more children staying, as it was noisier coming from the pool area than on Sunday. But the noise quickly subsided by bedtime. We liked the vouchers for a cooked, egg and bacon breakfast in the adjoining restaurant, rather than many hotels' idea of breakfast. Also, the drink coupons in the adjoining lounge were a plus. My wife used the exercise room and didn't have any complaints. We would, and probably will, stay there again. My husband and I just stayed 4 nights here for a conference. The front desk staff and housekeeping staff were all very friendly and helpful, as well as the restaurant staff. Dee, the manager, was fantastic in planning and executing our stay. I would give this place 5 stars but the rooms were a bit worn and although we were upgraded to a hot tub room, it faced the pool area and had no windows to the outside, which made it seem somewhat dark and dreary. Otherwise we thoroughly enjoyed our stay. Thanks again to Dee and your staff! Thank you for taking the time to write a review of our hotel! I am happy to inform you that in addition to the new beds we received recently, we will be receiving new furniture in about a month! We look forward to your return visit! 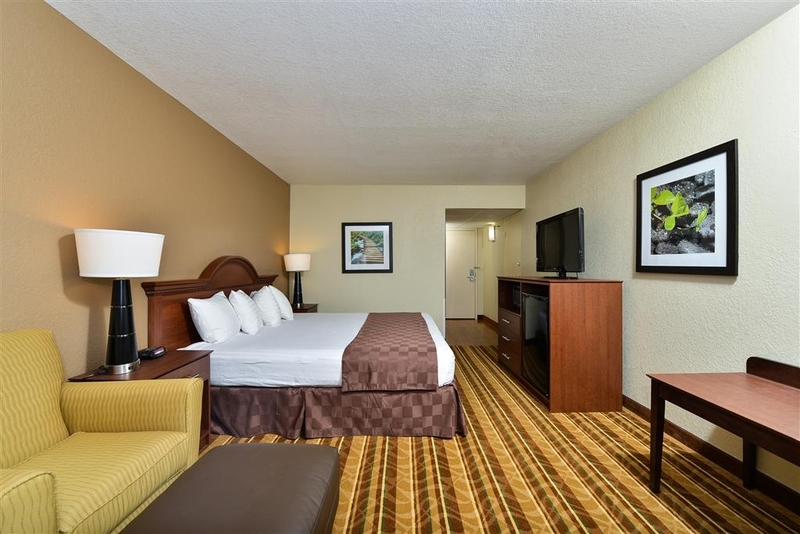 "Yes, I would stay here again"
I enjoyed my 2-night stay at the Best Western Regency Inn. Friendly, helpful Front Desk staff, room was clean. King-size bed with 4 pillows - very comfy! Received a coupon for complimentary breakfast in the attached restaurant - good value with good service. Note - no elevator to 2nd floor. Did not know that from booking on-line. Yes, I would stay here again. Thank you for taking the time to write a review! It made our day. We look forward to your next visit! Front desk, maintenance, house keeping, and restaurant staff were helpful and friendly. Each encounter, regardless of time, had a positive response. They addressed any and all request pleasantly and quickly. Thank you so much for your kind words! I will pass them along to the staff. We hope to see you again! "Nothing in the room work and their was bugs"
I will never stay here again, I took my family on a trip and when we got to the room the toilet didn't work, the shower didn't have hot water and the air was so hot you couldn't get it cold, we felt like we was cooking and my granddaughter got bite by bugs.. Very nice hotel and staff. The staff went out of their way to make us feel welcome. VERY FRIENDLY and helpful. Will stay there again in future. Wish they were still pet friendly though. New restaurant and breakfast. Thank you so much for staying with us! Come visit us again and make sure you try a "Taylor Maid Rite" sloppy joe....Marshalltown is famous for them! So glad you chose to stay with us! We appreciate your kind words. We look forward to having you in the future!